This month’s GOAL: We are committed to 21 days brisk walking. We are also hosting a DietBet this month. Download this month’s printable tracking calendar below. The fun starts on May 1st! Experts say that it only takes 21 days to form a new habit, so this means that in 21 days you could go take an old habit and break it or you can acquire a new habit- preferably a positive one! For those of you interested in health and fitness, this is some handy information that will serve you well. You CAN develop a healthy fitness and/or health habit within 21 days to benefit you in so many ways! Does this sound too easy? Do you think you could do it? In 21 days? We challenge you to take the next 21 days to start or re-start your weight loss journey by cultivating a new workout habit: Brisk walking. It’s a fact: brisk walking can help you get in shape and lose weight. You don’t have to hit the gym or join an aerobics class in order to burn calories necessary for weight loss. For many of you who are just beginning your journey, walking is the perfect match. In fact, University of Pittsburgh researchers assert that those who walk for 30 to 60 minutes per day were likely to lose weight even if they changed nothing else in their lifestyle habits. * Plus, walking is something that you can do for free. You can walk around your neighborhood, in nature, on a treadmill in the gym, at the mall, on trails, at a track and more. There are even walking DVDs that you can use at home. No excuses. The key is to be sure that you are walking at a fast pace or what many call “brisk walking”. Basically, this is not about strolling or walking slow. You want to walk at a fast pace. You can even pump your arms for even more affect. This might not sound like much, but you could burn up to 200 calories each time you walk briskly 30 minutes, so if you do this every day, you’ll have burned 1,400 calories by the end of one week. With 5 days a week minimum, you could burn in the range of 1000 calories per week. ** If you really watch your eating habits on top of this, you’ll be good to go! This calendar includes a daily affirmation to help you develop a new mindset this month. Repeat the affirmation to yourself during your workout. Make a commitment for 21 days to eat healthier and walk briskly for at least 30 minutes, at least 5 days per week this month until you reach 21 days. We encourage you to introduce healthy foods such as fruits and vegetables into your diet on a daily basis and eliminate some unhealthy foods (junk foods, foods with little nutritional value). 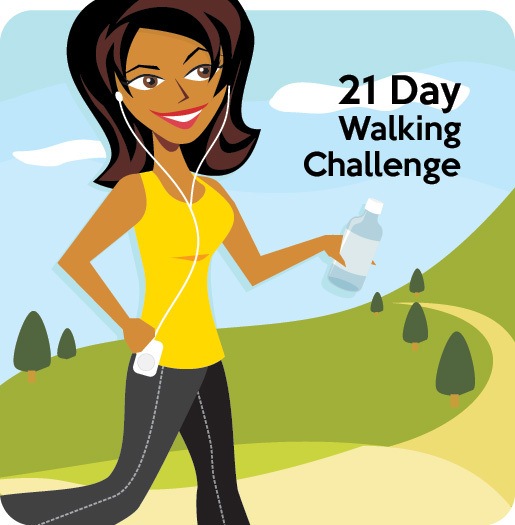 Leave a comment below and let us know when you plan to start your 21 days of brisk walking and where you plan to walk. Record how long you walked and/or your step total next to the words “TOTAL TIME/TOTAL STEPS”. Invest in a fitness tracker (FitBit, Jawbone, Garmin, etc) or pedometer. You could also use a mobile app that tracks your steps via your phone. Need Motivation? Visit our Facebook page daily inspiration. Use the challenge hashtag: #BWLW21 so that we can find your posts and encourage you. Join our May Dietbet – The fun starts on May 6th. $30 Bet – Lose 4% of your weight and spilt the pot with other participants who have done the same. Photo weigh-in May 4-5th. Join us! Find a family member, co-worker or friend to commit to doing this with you. It will make it easier to partner with someone in this endeavor. Commit to become healthier and get moving. If you need motivation, get some. Read the stories of others who have gone from unhealthy and overweight to healthy and slender, listen to motivational speakers and invite your friends to encourage you. Invest in some recipe books that have healthy recipes and try your hand at cooking lighter meals. Heck, you might even want to form a neighborhood walking party! Disclaimer* Before starting any exercise program, please consult with your doctor. We cannot be held responsible for any injuries resulting from attempting this exercise routine. If you have injuries that could be worsened, are pregnant, have knee issues, or are suffering neck and back pain, you should speak with a professional trainer about what workouts would be best for you. Do not attempt if you have current injuries, past surgeries or other physical issues/health issues that could be affected by exercise. Calories: Intensity of your workouts, age, weight, body fat vs. muscle, health and other factors will impact calorie burn so these are estimates. You can invest in a fitness tracker, like Polar watch or FitBit for a better idea of how many calories you’re burning. I do bootcamp in the mornings and my evenings are pretty busy but I’m figuring out a way to walk 21 days and beyond. I am joining for physical exercise and better health. I’m starting this May 1st. I’m excited to see if I can really build a habit from doing it for 21 days straight. I have COPD. But I will not let that stop me from doing this. It might not be brisk but it will be done! Just what I need to get back on track with my goal to get movin’! I know I need to walk more as a dailu habit so Im using this challenge as a kick start. Will start on May 1st if the doctor will permit me!!! May n0t be brisk but it will be done!!! I’m in it……count me in…..
Not able to get calendar to download. Can someone send it to me. I checked to send via email and still has not appeared. Hi Vickie, Hopefully I can help you. Could you check your spam folder? Interesting not in Junk/Spam filter. I used my work email address and it came within 2 minutes. Oh well yahoo account failed me. But I do have it now. I am totally in with everyone else as well. I am using this challenge to walk flights of stairs. Wish me luck. You’ve got this! Thank you for joining us. I’m joining some of my Sorors on May 1st to kick-start my exercise routine for better health and weight loss. Just what I need to get me back on track!! I’m in!! I’m in for myself and my daughter! Im in. 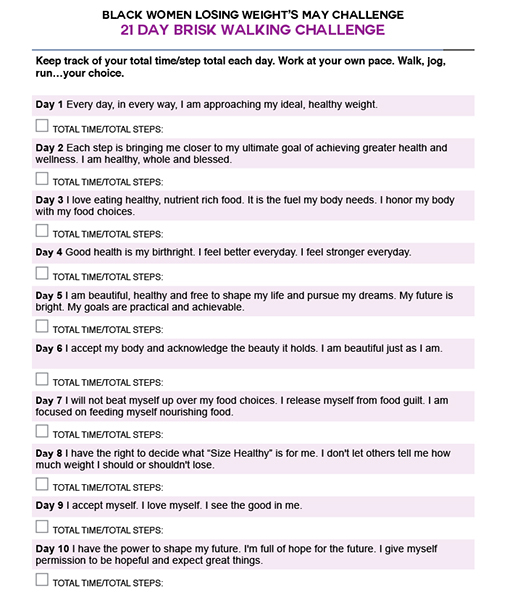 Just seeing this, so ill start tomorrow. Just double my time.